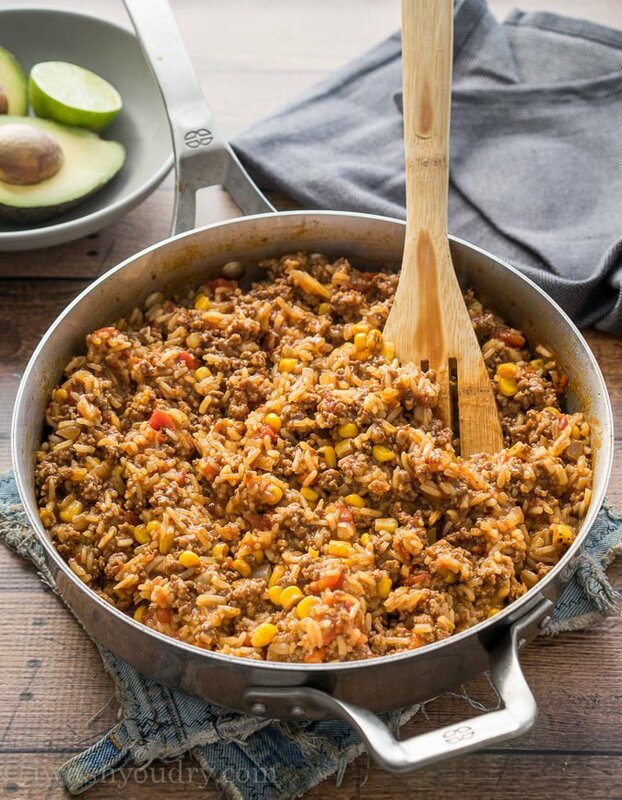 Welcome to Easy Dinner Street with this One Skillet Mexican Beef and Rice. Someone needs to take my Mom card away. Apparently a few months back I thought I had my life under control and decided to sign my three youngest kids up for the Spring Soccer League, all the while, my oldest daughter is in club swimming. Guess what folks… my life is NOT under control. It’s just a blur of calendar events that include soccer practice, dentist appointments, swim meets, cub scouts and have mercy, it’s also tax season. 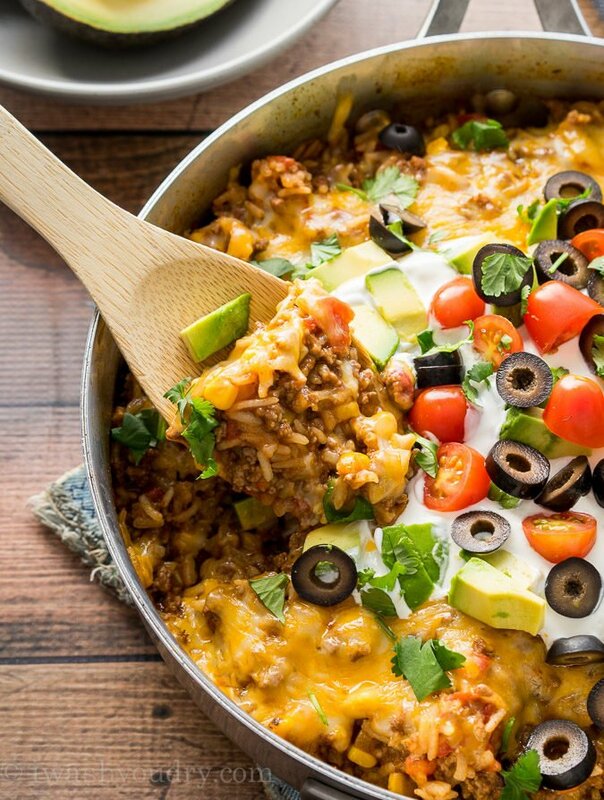 I’m literally drowning in mom duties, grasping for air and easy one skillet dinners to make my life a little easier. And heaven forbid I make a dish that my picky 6 year old doesn’t like, cause then it’s all tears and whining and I’m thisclose to the end of my rope and ready to hang myself on it. Maybe that’s a bit dramatic. I guess when it comes down to the end of the day I know I’ll survive. And I’m sure every Mom and Dad out there knows exactly what it’s like to feel like you’re ready to just ‘Netflix and Chill’ while the rest of the family tries to hold it all together. But we persevere. We forge forward and most of all, we find easy and filling dinner recipes like this one. Oh yes. Even my picky 6 year old loved this one skillet dinner recipe. 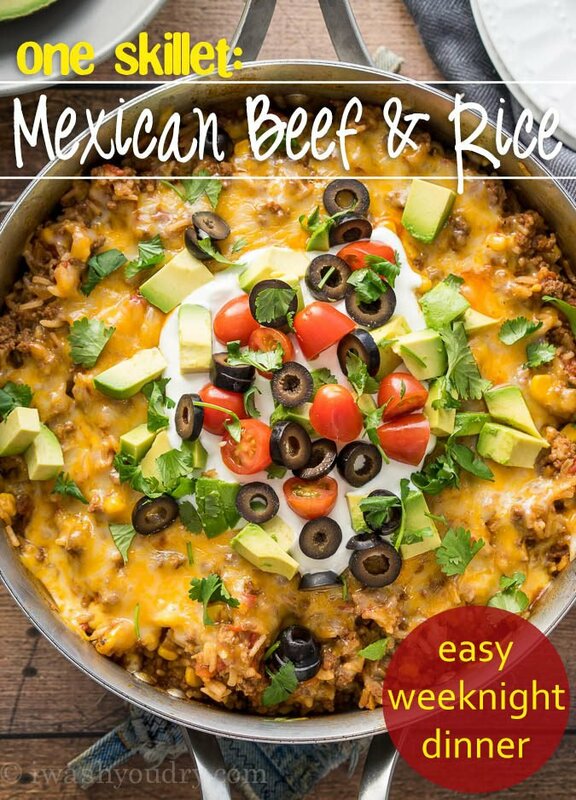 It’s the perfect combination of taco meat, rice, corn and lots of cheese. You can throw in a can of black beans or pinto beans if you want to bulk it up even more. The toppings are also totally optional, but they seriously take this dinner to the next level. 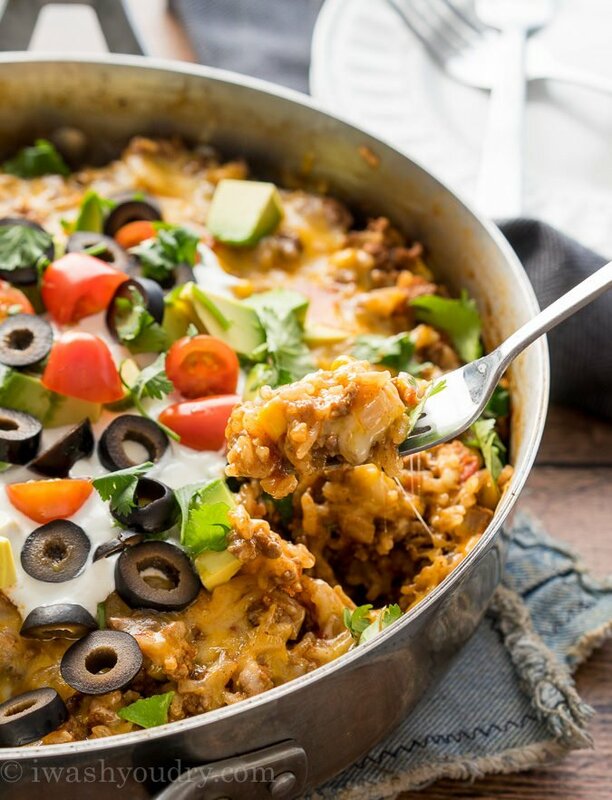 We enjoyed this quick and easy dinner straight out of the pan the first night, but the next day we used up the leftovers in a warm flour tortilla and wrapped it up burrito style. Super quick and super easy. aka Parent Life Savers. 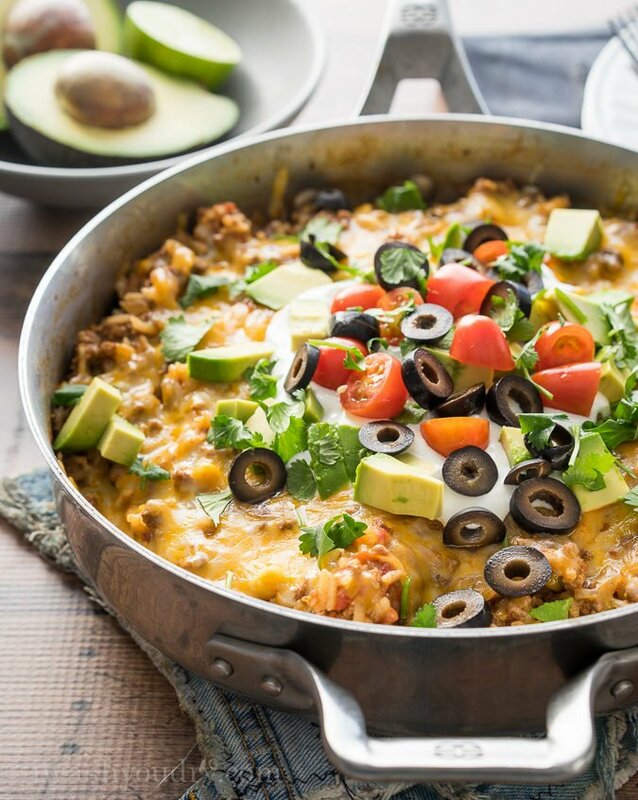 This quick and easy taco inspired skillet comes together so fast and will become a family favorite. Cook the onion in a large skillet over medium heat for 1 to 2 minutes, then add the ground beef, using a wooden spoon to break up and crumble. Cook until no longer pink. Drain and discard fat. Return skillet to heat. Add the taco seasoning, diced tomatoes, corn kernels, rice and beef broth, stir until combined. Bring to a small boil, reduce heat to a simmer and cover. Cook for 20 minutes, stirring at 10 minutes. 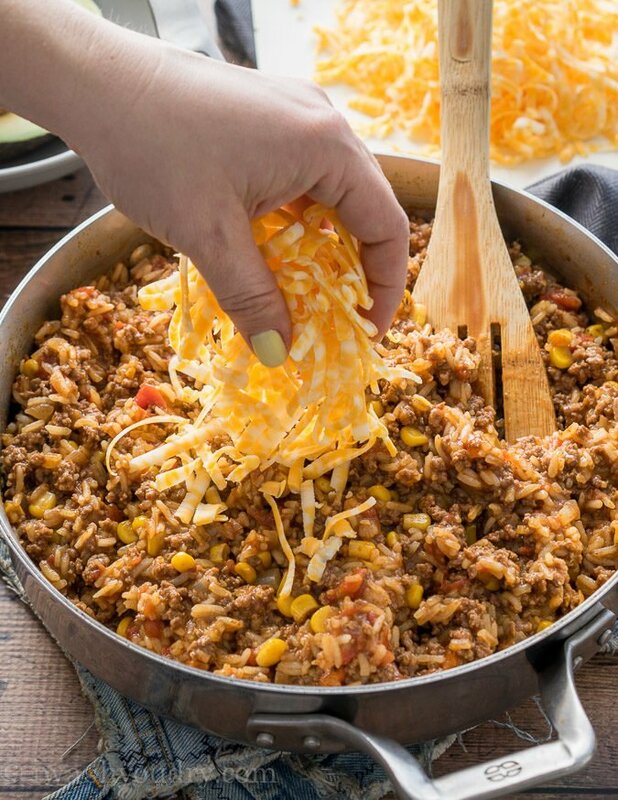 Stir and top with the shredded cheese. Cover and cook on low for an additional 3 minutes or until cheese is melted. Top with the taco toppings of your choice! Enjoy! You can use regular corn kernels in place of the fire roasted ones. You can also add a 1/2 cup of rinsed and drained black beans to the skillet before covering to cook if desired. Can you do this recipe with pasta? You could try 1 cup of small pasta (elbow or small shells) in place of the rice, and reduce the beef broth to one cup. Hope this helps! 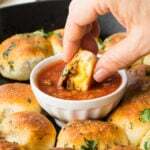 Great, super easy recipe. I made this earlier this week for my partner and I and it’s lasted for a few days of leftovers while he’s away. It’s going to become a go-to recipe for when he goes on business trips. What can you substitute the chicken broth with or can you leave it out??? You can use beef broth, vegetable broth or just water. Don’t leave it out or the rice wont have enough liquid to cook. I finally got around to trying this. I was expecting it to be a good everyday family meal. What I wasn’t expecting was just how good it was! This is certainly a keeper that will be made regularly! Thank you for yet another great meal! wish there was some nutrional information for the recipe. You can definitely double it and make it in a dutch oven. We love this recipe too! Can you use brown rice instead? Would you need to change the cooking time or liquid amount? Looks delish. This was fantastic!!! I didn’t have cilantro and next time I will add chives. Forgot salsa but it was great without! Your recipes look great! 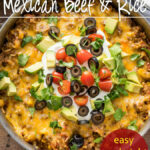 I’m going to try your Easy Ground Beef Enchilada and Easy Mexican Rice with your Taco season and Enchilada sauce tonight. I’m also looking for a good and easy Refried Bean recipe do you happen to have one? 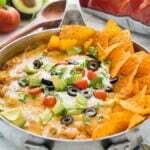 I cook a lot of pinto beans and always have left overs and would like to make Refried Beans with them.